named Juana, then Fernandina, finally Cuba. 1511 - 1764 Subordinated to Santo Domingo. 16 Nov 1519 San Cristóbal de la Habana founded. 13 Aug 1762 - 8 Jul 1763 Occupied by Britain. 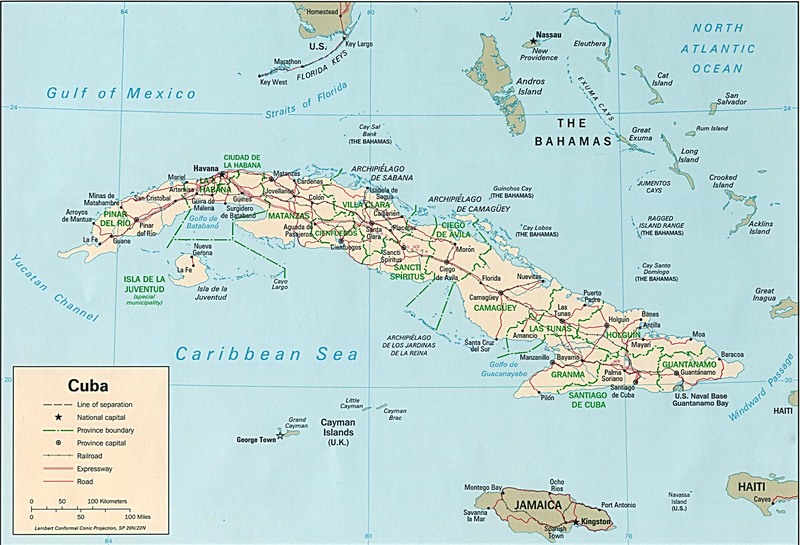 19 Mar 1812 - 4 May 1814 Cuba a diputación provincial of Spain. 19 Mar 1820 - 1 Oct 1823 Cuba a diputación provincial of Spain. 14 Aug 1836 - 16 Jun 1837 Cuba a diputación provincial of Spain. 10 Oct 1868 - 28 May 1878 Ten Years' War (first Cuban war of independence). as República de Cuba en armas). 24 Feb 1895 - 15 Feb 1898 Cuban war of independence. status of the Isle of Pines to be determined. 28 Sep 1906 - 31 Mar 1909 U.S. occupation. 19 Feb 1917 - 15 Feb 1922 U.S. troops deployed in Camaguey province. Territorial Dispute: U.S. Naval Base at Guantanamo Bay is leased to U.S., since 1903 and renewed 1934, and only mutual agreement or U.S. abandonment of the area can terminate the lease. but Isle of Pines is not mentioned by name in the treaty. Isla de Pinos (Isle of Pines) to be determined. U.S. tariff purposes as foreign territory. Treaty of 2 Mar 1904. 28 Jun 1978 Renamed Isla de la Juventud (Isle of Youth). 10 Jun 1898 U.S. occupation. 10 Dec 1903 Guantanamo Bay Naval Station leased to U.S.
10 Dec 1913 Naval Station officially opens. lease), treaty is reaffirmed again in 1963. 1 Apr 1941 Renamed U.S. 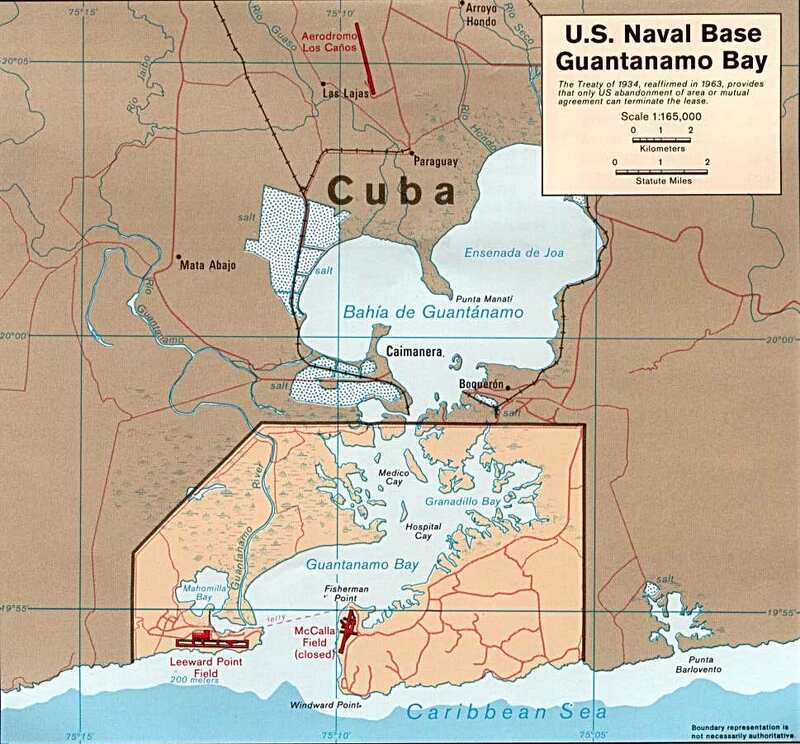 Naval Operating Base Guantanamo Bay. 18 Jun 1952 Renamed U.S. Naval Base Guantanamo Bay. or U.S. abandonment of the area can terminate the lease.